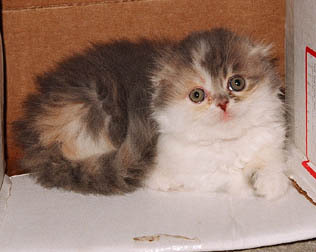 Maddie is a blue patched mackerel tabby and white, folded-ear, long-hair girl. 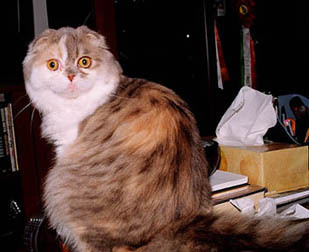 She has a very solid body with large wide eyes. She is very friendly and loves to be held. Maddie has really become comfortable in the show hall. She is now a Grand Champion. Maddie now lives in Russia and has just completed a very successful show year there. Check out her page to see all her accomplishments! 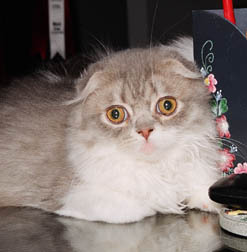 Jann is a blue mackeral tabby and white, folded-ear, long-hair girl. She is very friendly, always seeking us out to be picked up and held. 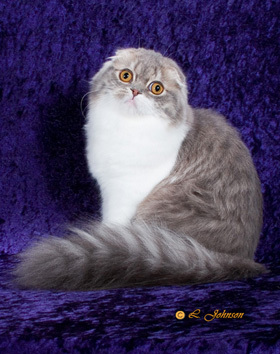 She has attended several kitten shows already, and is extremely comfortable in the show hall. She loves the attention! Jann is now living in Columbus, Ohio, and will continue to go to shows. See her own page. 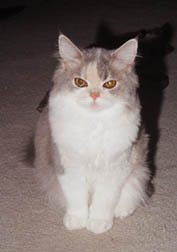 Sasha is a dilute calico and white, straight-ear, long-hair girl. She is very laid-back and easy going. 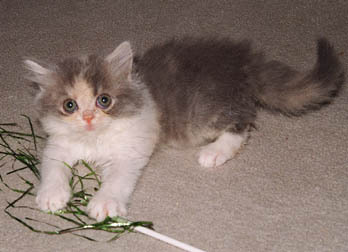 Her favorite toy is the tinsel wand. Sasha now lives in Kitchener, Ontario. She thinks it's wonderful having one human to dote on her ALL the time! 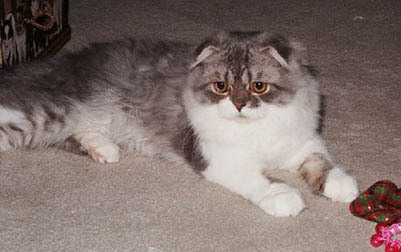 Luke is a blue-silver and white folded-ear, long-hair boy. He has a nice solid body and a great coat. He is very friendly and loves to jump on his sisters. Luke is now a Premier in CFA, and working on his Grand Premier ribbons. Here is Luke's page.